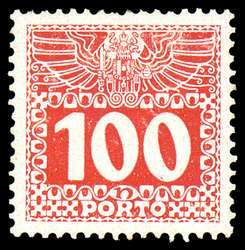 Scott #J4, Perf 10.5, 1894 5kr brown Postage Due. Mint Superb, LH. 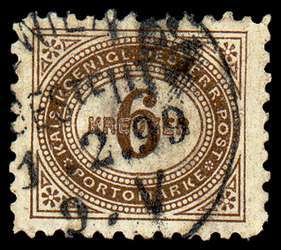 Scott #J5, Perf 10.5, 1895 6kr brown Postage Due. Used VF. Fully dated cancellation. Scott #J22-5,28, Various Perfs, 1899-00 1h-4h, 10h Postage Dues. Mint VF. Partial set. Scott #J34a,38a, Chalky Paper, 1908-13 1h, 10h Postage Dues. Mint VF.